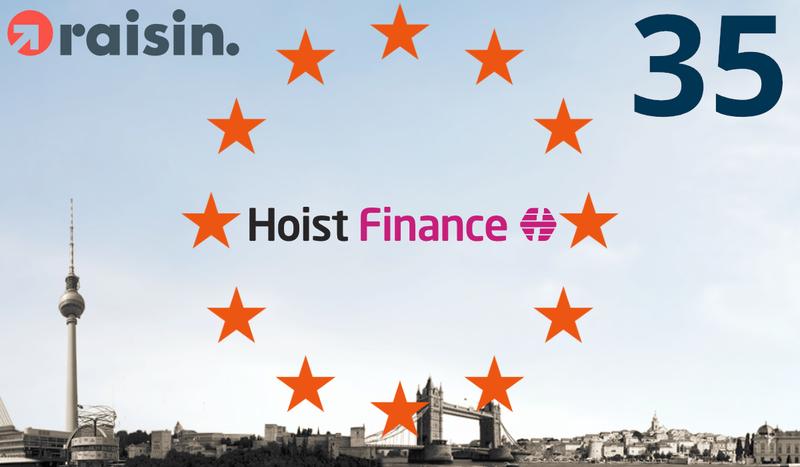 Today, Raisin welcomes its newest partner bank from Sweden: Hoist Finance. The financial services group is not only the 35th partner on the platform, but it makes investing possible for even more savers: With Hoist Finance, German savers can open an account with a minimum of 1,000 euros, earning interests of up to 0.85% for a term deposit. Hoist Finance offers 1-year, 2-year and overnight deposits and is the only company on the platform that have a savings offering from a 1,000 Euros. The institution is headquartered in Stockholm and is present in eleven European countries, including Germany, France and the UK. Hoist Finance is listed on the NASDAQ Stockholm Stock Exchange since 2015 and has a proven track record of profitable growth: With 1,300 employees, close to 70 thousand customers, almost €1.2 billions in deposits and a total balance sheet of nearly 2 billion Euros, Hoist Finance is a well-known financial institution in Sweden. Deposits up to an equivalent of 100,000 Euros per customer are secured by the Swedish deposit guarantee scheme in accordance with EU directives. With Hoist Finance joining, Raisin is further consolidating its leading position in the European market, offering now 154 products from 17 European countries. All of them can be opened and managed through a simple online banking system by the customers. Before Raisin launched its service, savers had to deal with barriers such as varying, complex account opening procedures in foreign languages, a lack of transparency about available offers from other countries, administrative requirements etc. Often, even the physical presence of the saver was required to open a deposit account with a European bank abroad. Since being founded in 2013, more than 90,000 customers have invested already over 4 billion euros through Raisin.